If people mention Barcelona, what do you first think of? Football, the Olympics, Las Ramblas, Freddie Mercury and Montserrat Caballé or or or….? I think one of the favourite responses would be, “Architecture” and that would be a very valid answer! Whether you are thinking of the Montjuic, the Estació de França, some of the modern skyscrapers, Gaudi’s legacies or even the Camp Nou everywhere you go in Barcelona there is somewhere fascinating to look at. 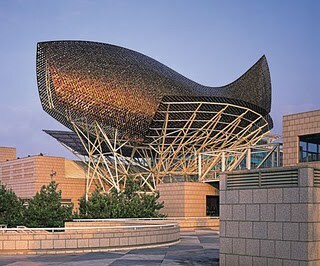 For me, one of the unique sites is “El Pez” (the fish) that was designed by Frank Gehry the architect of the Guggenheim Museum in Bilbao. .It is always worth a “pilgrimage” when I visit Barcelona. For more details of Gehry visit the Spain-Holiday site.